West Valley College in Northern California was built in the early 1970s, and since then has suffered many of the problems associated with that era’s lackluster community college design. The school’s concrete construction, though durable, limits visibility indoors and out, and also makes spaces less adaptable than the campus required. The Campus Center, a newer building, created another issue; it cut off two nearby outdoor plazas from each other, leaving them isolated and underutilized. To make up for the situation, West Valley was using makeshift signage to try to draw students in, helping them locate administrative and counseling buildings. Overall, the campus plan suffered from poor traffic and circulation. 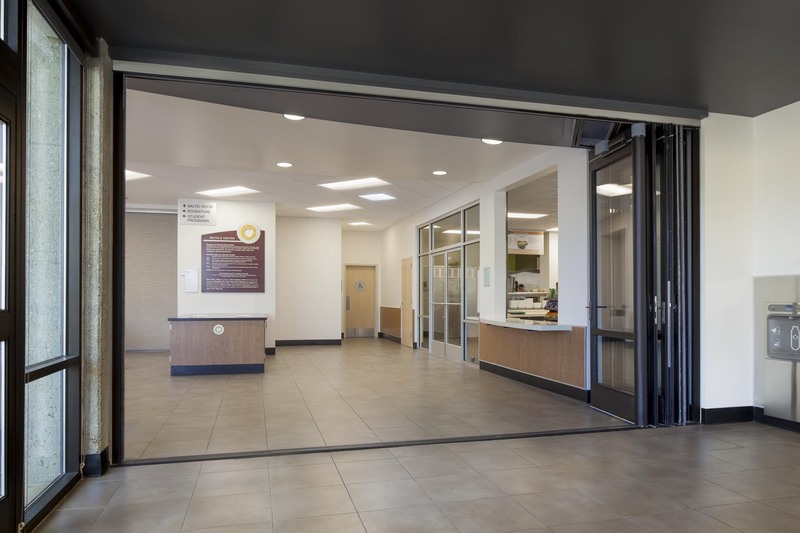 The Campus Center, however, was aptly named, as it resides in the heart of the campus and is a central place for students to congregate, eat and buy school supplies. It needed to become a better hub of activity. 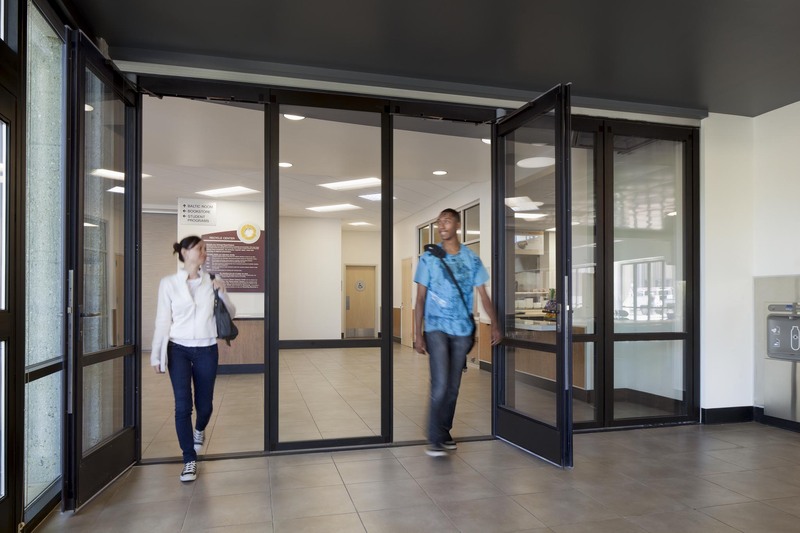 Deciding to solve these challenges once and for all, the school enlisted architecture firm BFGC-IBI Group, which created a design to address the concerns. 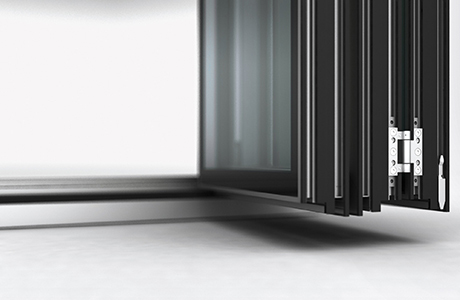 At the center of their concept was the NanaWall SL70 Folding System, used both in exterior wall and interior partition locations. 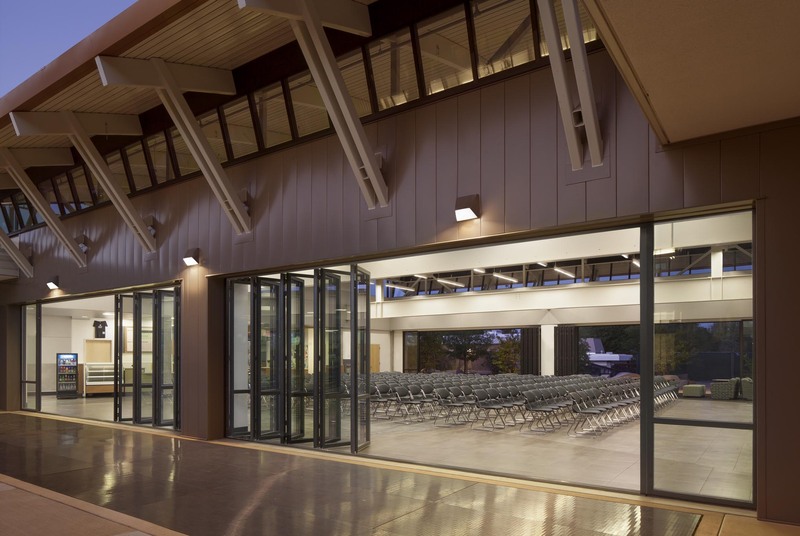 "The Campus Center blurs the line between indoor and outdoor space. The NanaWalls creates a flexible environment." 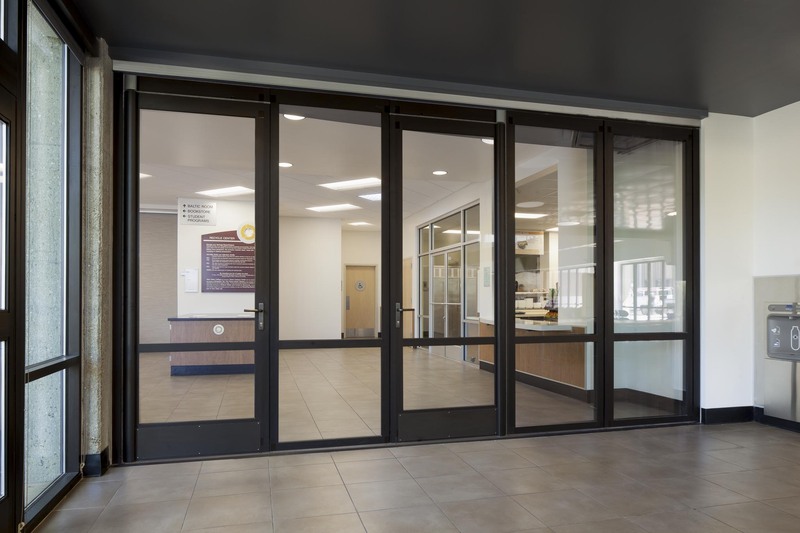 The aluminum-framed, thermally broken system replaced the existing, single-glazed storefront windows. To contrast the beige truss work and bronze siding, BFGC-IBI Group chose dark gray anodized frames. The panels’ limited fenestration (a single mullion bar divides the lower third from the top par) provides excellent illumination and a modernist aesthetic. The result is an attractive façade that addresses issues of flexibility, visibility and sustainability. One of the NanaWall installations links the two plaza spaces previously separated, creating a new artery for traffic and restoring the plazas to regular use. Another installation in the student center increases the usefulness of the main space. 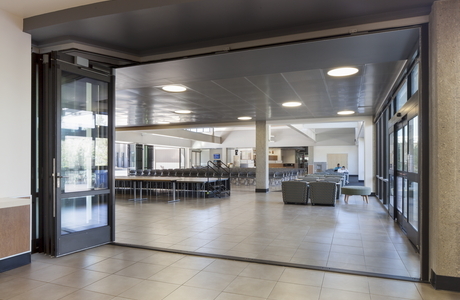 With a fully operable wall of glass, the administration now rents the space for use as a function hall, hosting weddings or parties and consequently bringing in a new source of income to the college. An interior installation of the SL70 system creates yet more visibility between previously obscured areas. 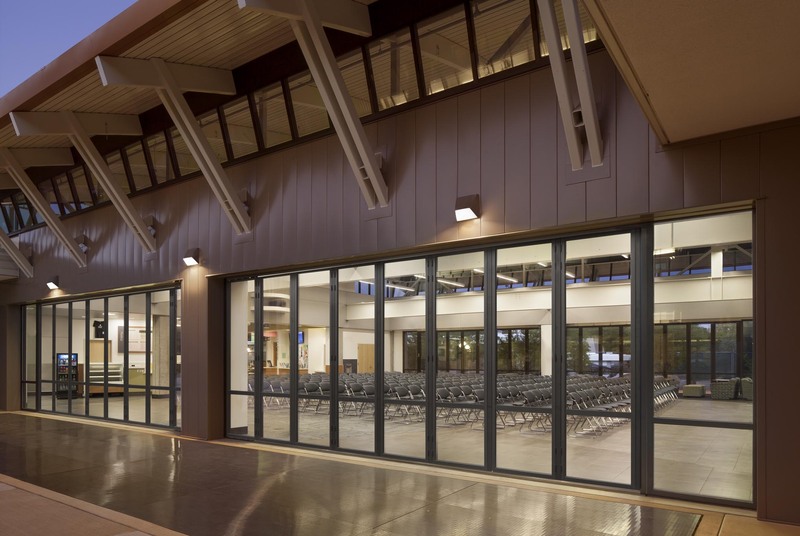 Ten openings and 72 panels make the Campus Center installations one of the biggest NanaWall projects in the country. The thermally broken system has also enhanced the sustainability of the campus. 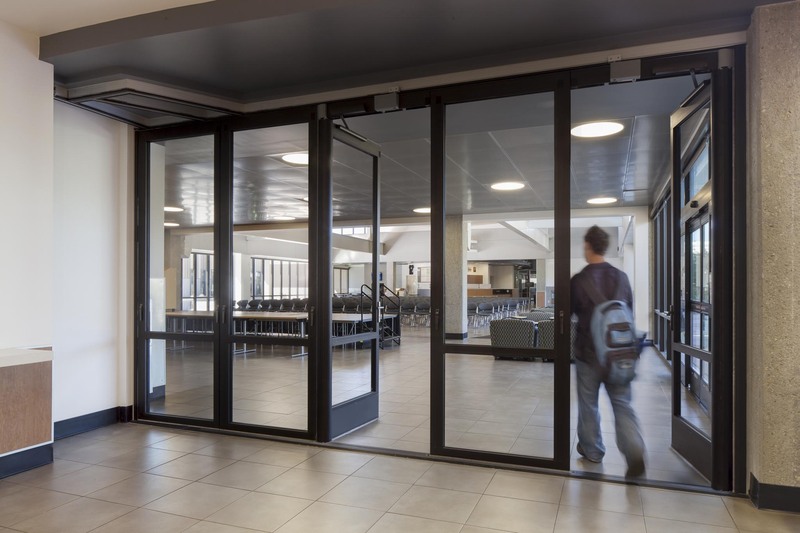 NanaWall’s SL70 improves the insulating value of the altered facades, reduces solar heat gain, and allows the college to harvest more natural daylight for indoor illumination. Architecture and interior design draw potential students to a campus, and so the Campus Center needed to be an exciting and beautiful environment. 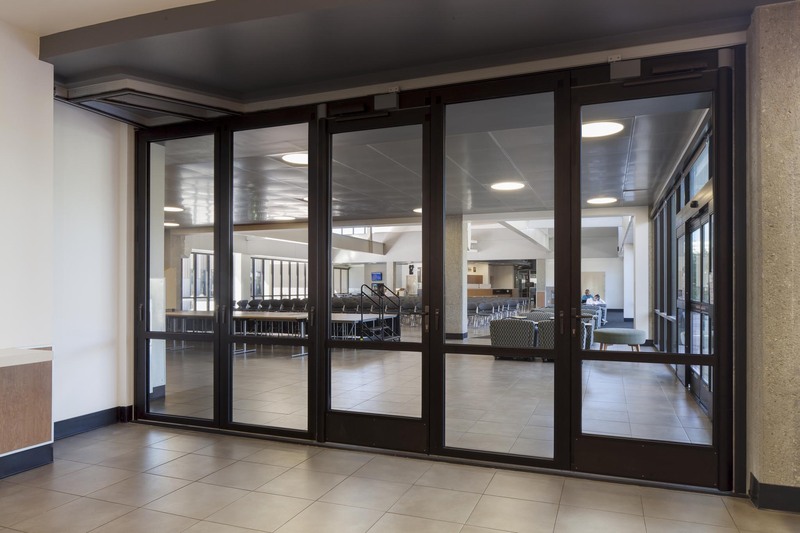 BFGC-IBI Group included many high-end finishes that complement the gorgeous NanaWall systems. 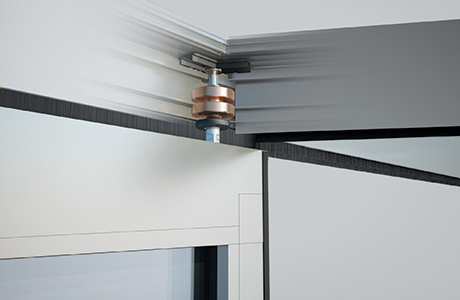 For example, the exposed steel is warmed with teak acoustical panels. The square interior tiles are mirrored in the concrete design on the plaza spaces. Finally, the bow roof juxtaposes the flat roofs of the nearby buildings. 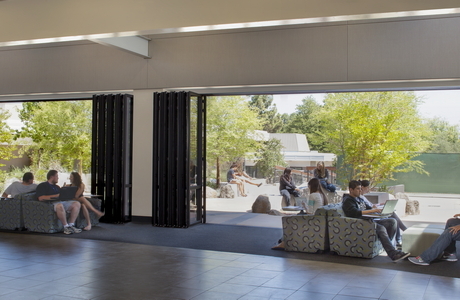 The Campus Center blurs the line between indoor and outdoor space. The Northern California temperate weather can be enjoyed as students eat their lunches inside or use their laptops on the plaza. The NanaWalls creates a flexible environment. The college echoes this flexibility with the main space—desks, couches or seating can be manipulated depending on the time of the day or function.